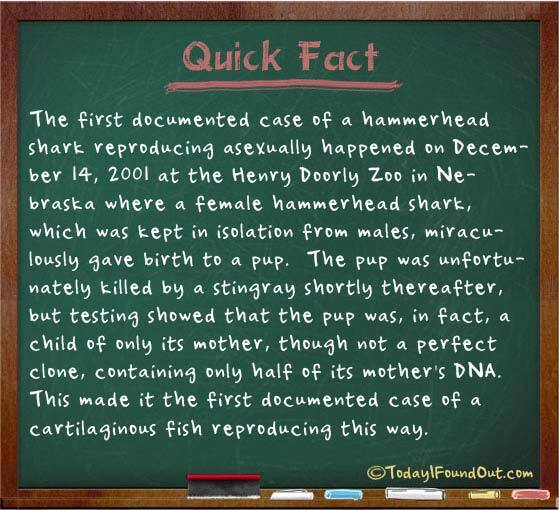 The first documented case of a hammerhead shark reproducing asexually happened on December 14, 2001 at the Henry Doorly Zoo in Nebraska where a female hammerhead shark, which was kept in isolation from males, miraculously gave birth to a pup. The pup was unfortunately killed by a stingray shortly thereafter, but testing showed that the pup was, in fact, a child of only its mother, though not a perfect clone, containing only half of its mother’s DNA. This made it the first documented case of a cartilaginous fish reproducing this way.